Every month I like to share my expense report and review how much money I spent on bills, one off expenses and miscellaneous things. Since this blog is all about budgeting, I like to do this to hold myself accountable and review my monthly spending. This helps me track potential bad spending habits and figure out where my money goes each month. This is still such a high number for me each month. I was expecting every expense, so at least there weren't any big surprises. I would love to get my bills down to $2000 a month and think it will much more feasible once I move. As I mentioned last month, I am currently deferring my student loans until January. I know that's not the best thing to do, but with the medical bills and saving to move, I'm trying to save money until I start freelancing next month. I was a little all over the place in August. I've definitely spent much more than this a month, but it is what it is. I haven't drank alcohol in what seems like forever. I'm been drinking a ton of coffee, grabbed lunch at work once (I've done this maybe two or three times ever) and definitely ordered Thai food a few times. Did I mention I hate paid parking? After a year of taking the bus to work, I caved and started driving to work. I have saved around 45 minutes to an hour off my daily commute which is awesome. I try to remind myself of this every morning when I fork over $15 to the meter. I am still side hustling each month. I'm also posting a photo of a job I did as mystery shopper. I had a few people ask me if mystery shopping is a scam and the answer is no! I received $48.91 that was directly deposited into my bank account. While all mystery shops pay differently, I received this payment from work actually done in July. I only mystery shop when it's convenient for me. I never go out of my way to mystery shop and make sure it fits into my daily schedule. I really slacked on continuing to clean out my closet. 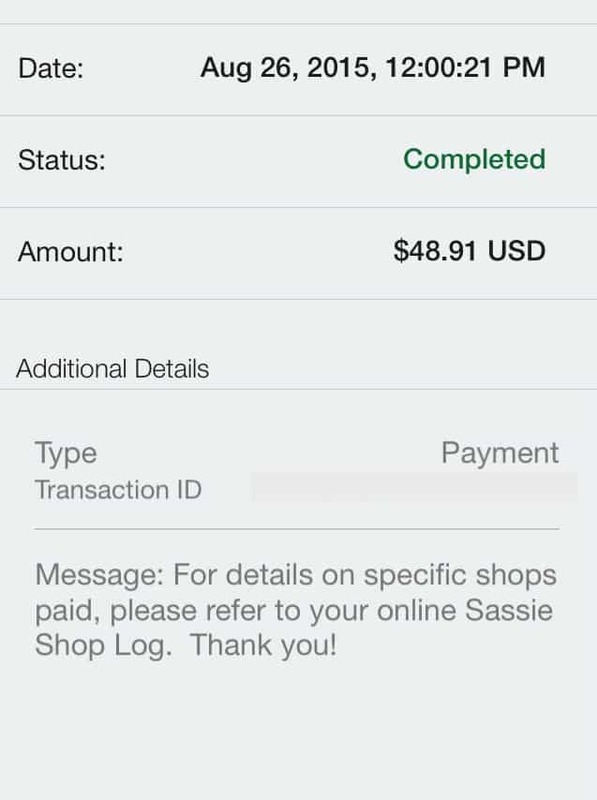 Last month I made over $350 on ebay selling old clothes. This month I only listed a couple things and cleared $30. If you want to get started with ebay, I made this tutorial. Blog income is still small, which I will be posting in my next post. 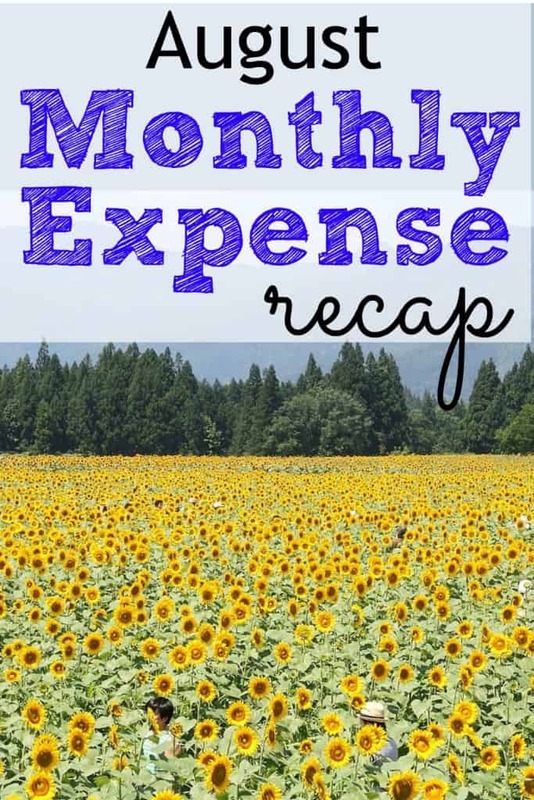 I am actually considering removing the blog expenses from the monthly expense reports and just keeping the blog income and expenses in one post. While I love blogging, I completely slacked this past month. I only blogged 1-2 posts a week. Right now I am focusing on what makes me the most money, so my blog took a back seat in August. Right now my priorities are my day job, my consulting side business (related to my day job), freelancing as a blogger, and then my own blog. Once I have more free time starting in mid October, this will definitely change as I do a better job of monetizing my blog. How was your August? Did you have any crazy expenses? August’s credit card was insane. Some of that was the yearly car insurance premium. The rest was just some unexpected things piling up, like they tend to. Otherwise, I think our spending was pretty good this month. I don’t keep strict track because we have so many things pop up all the time. Instead, I just plop a set amount of money in the account, and it has to last a week. Our August expenses were fairly low (with the exception of purchasing a new car, but that was expected). Our September expenses, however, are already high. We put off a lot of things in August (which accounts for the low expenses in August and the high ones in September). However, since school is back in session and I’m substitute teaching on a regular basis, our income is higher. Oh nice job on the substituting 🙂 I have some months like that where 1 month is low and then the next month is ridiculously high. I guess it all works out! I had a crazy spending last August and now I just made a spreadsheet for my daily expenses. I hope I can stick on my budget starting this month. Everything changed for the better once I made a spreadsheet! I went from naive and clueless to really tuned in 🙂 Good luck! You do a good job of tracking your expenses. I wish I could do the same. Unfortunately for me if it doesn’t appear on my bank statement, I have no knowledge of it and usually end up have a nice amount of cash unaccounted for. This month I’m tyring to do better by keeping up with receipts!